Indoor Voices, the podcast co-hosted by Kathleen Collins (John Jay) and Steve Ovadia (LaGuardia) is going strong in its second season, thanks to support from the Office for the Advancement of Research and a wealth of interesting work done by people all around CUNY. Visit the blog at indoorvoicespodcast.com to peruse past episodes and subscribe to keep up with new ones. Follow them on Twitter @indoorvoicespod. 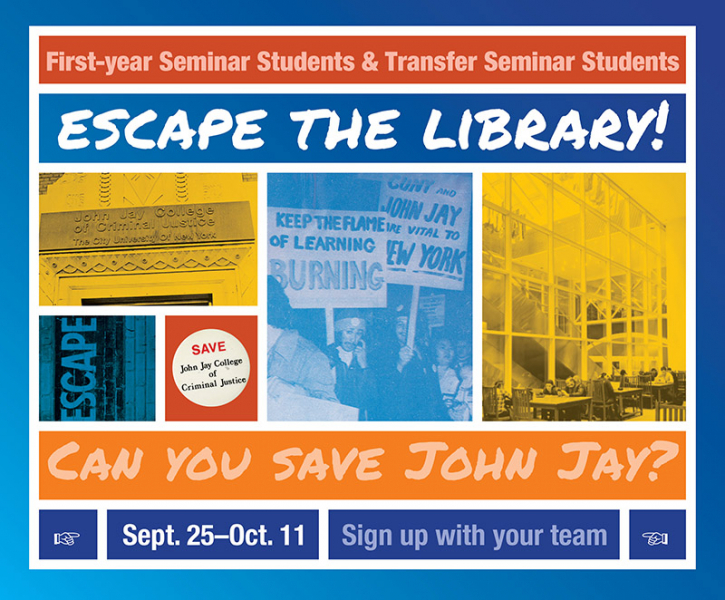 The Lloyd Sealy Library and Student Academic Success Programs (SASP) partnered up to coordinate the “Escape the Library!” challenge. This hands-on learning activity introduced first-year and transfer students to basic library research skills and study spaces available to them. SASP Peer Success Coaches attended each day of the game to help guide participants toward solving the puzzles. Over the summer, 137 students participated in the game, and four dozen more did in the fall semester. In total, over 700 students have participated in the game since its inception in 2013. Overall, this semester’s “Escape the Library!” event was a success: students rated the activity highly and met the library’s learning objectives. We welcomed Betsy Crenshaw as an adjunct assistant professor in the library. She will bring her extensive experience from multiple CUNY libraries to the Reference Desk at Lloyd Sealy Library. Welcome, Betsy! Kathleen Collins published “Comedian Hosts and the Demotic Turn” in Llinares, Fox, and Berry, eds. Podcasting: New Aural Cultures and Digital Media (Palgrave Macmillan, 2018), available to read on CUNY Academic Works. Robin Davis gave a presentation, “Keep it secret, keep it safe! Preserving anonymity by subverting stylometry” in October at PyGotham, an annual conference for Python programmers in New York City. With Mark Eaton, a librarian at KBCC, she led “Python for Beginners: A Gentle and Fun Introduction,” a LITA Pre-Conference Institute at the ALA Annual Conference, which took place in New Orleans in June 2018. Maria Kiriakova published “Combatting Corruption in the USA: State, Dynamics, and Tendencies,” co-written with Y. Truntsevsky, in Public International and Private International Law: Science-Practice and Information Journal, vol. 100, no. 3. Jeffrey Kroessler appeared in the PBS documentary “The Woman in the Iron Coffin” in the series “Secrets of the Dead,” about the remains of an unidentified African-American woman found in Queens in 2011. His report, prepared for the City Club of New York, “Losing Its Way: The Landmarks Preservation Commission in Eclipse,” was reprinted in Environmental Law in New York (vol. 29, no. 8 and 9, Aug. and Sept. 2018) and is accessible through CUNY Academic Works. In October, he presented his research on terrorism in New York City to the Seminar on the City at Columbia University. Maureen Richards presented at the ExLibris Northeast User Group 2018 conference in October on what we are learning from the use of the library’s web-scale discovery tool, OneSearch. Ellen Sexton and Vee Herrington presented “Using LibGuides and Eportfolio as hosting platforms for ZTC [Zero Textbook Cost] courses” at Open Ed 2018 in October in Niagara Falls.